Love this *HIGHLY RATED* Portable Induction Cooktop Countertop Burner for $74.99 (Retail $149.99). •Digital LCD Sensor-Touch Control Panel; Child Safety Lock system (press and hold the Safety Lock Key for 3 sec to activate), Fast Boil button &amp; Keep Warm button. 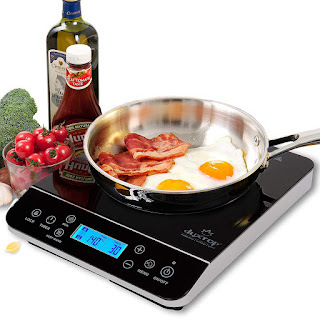 •Duxtop Induction Cooktop uses 120 volts, 15 amps of electricity – standard in all homes; Lightweight and compact for easy handling and storage. •Built-in count-down digital timer with 1 minute increments up to 10 hours; 20 temperature ranges from 100°F to 460°F; 20 power levels from 100-1800Watts; 5 ft cord. •Compatible with Duxtop Whole-Clad premium cookware and other induction ready cookware such as cast aluminum enameled iron and steel, stainless steel with a magnetic bottom, or cast iron. The auto-pan detection will shut the unit off automatically after 60 seconds if no cookware, or the incorrect cookware is detected; Equipped with diagnostic error message system, Low and high voltage warning system; ETL approved and built to North American Standards. 1-year •Manufacturer's warranty. •Note: In order to use this and any other induction cooktop, you need to have the right kind of cookware. The "rule of thumb" to determine if your cookware is induction ready is; if a magnet sticks to the bottom of the cooking vessel, it is induction ready. Induction itself is a noiseless process; however there may be high pitched sounds from clad cookware, the base of which has multiple layers of metals sandwiched together.